Making Upgrades and Improvements to a Home to Age-In-Place? Here’s what to consider. With the rising age of the Baby Boomer generation, the population of older adults in the United States will increase significantly during the next few decades. Some of these folks will have the means to retire in an assisted living facility. Others will move in with children and grandchildren as a way of growing older with the attentive care of loved ones. Not all are as fortunate, however, to have these options, and even some that do prefer the idea of staying in their own homes. They value the familiarity of the environment and neighborhood and prefer not to uproot and start over in their later years. 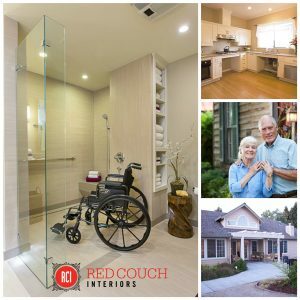 While all of these options are certainly viable, preparing a home for “aging-in-place” is becoming a more popular alternative and one that should be considered when making upgrades and improvements to a house. It will be increasingly important for homeowners to hire designers and contractors who are educated about the options for aging-in-place and can convey that knowledge to their clients. Some professionals may be hesitant to broach the subject for fear of offending the homeowners, but it’s really to your benefit to hire someone who is mindful of the need to create spaces that are conducive to long-term independent living and who understands the challenges that could pop up during the design process. If the desire is to stay in one’s own home as long as possible, it is vital to think about both people-related issues as well as environment-related issues. As a person ages, he or she could experience a decline in numerous areas, such as strength, memory, mobility, vision, and hearing, to name a few. The ultimate goal is to create a “barrier-free design,” keeping in mind both predictable and unpredictable needs that will arise. 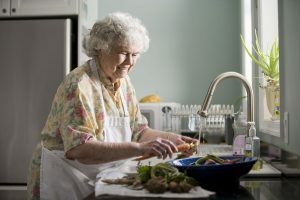 At the very least, the homeowner will need to be able to function independently in regard to basic daily tasks such as cooking and hygiene maintenance. Here is a list of changes, renovations, and upgrades to consider if living independently in your own home is important to you. Install slip-resistant floors, especially on stairs and in high traffic areas. Create open spaces and wide hallways and doorways to accommodate wheelchairs and walkers. Lower electrical switches and increase the height of outlets to accommodate decreased mobility. Prioritize a first floor master bedroom and bathroom, changing the footprint of the home when necessary. Install grab bars and railings, particularly on stairs and in bathrooms. When possible, eliminate steps by adding ramps or creating zero-threshold entries in both the interior and exterior of the home. When steps cannot be removed, install a wheelchair lift. Install a walk-in shower rather than a bathtub, and be sure to include a handheld shower faucet. Replace traditional doorknobs with lever-handed knobs to benefit arthritic hands. As home and accessory design have evolved over time, new ideas and items to accommodate the elderly are less conspicuous and tend to blend more seamlessly with original design and décor. Aging-in-place can be a pleasant and enjoyable experience when the proper steps have been taken. Finding a designer and/or contractor who understands this process will be the key to a smooth transition.